admin December 26, 2018 December 26, 2018 No Comments on Ask A Vet: We Are Moving. How Can I Help My Cat Adjust? Moving is stressful for everyone. All living things have some difficulty accepting change. Animals who live in nature experience change more gradually. 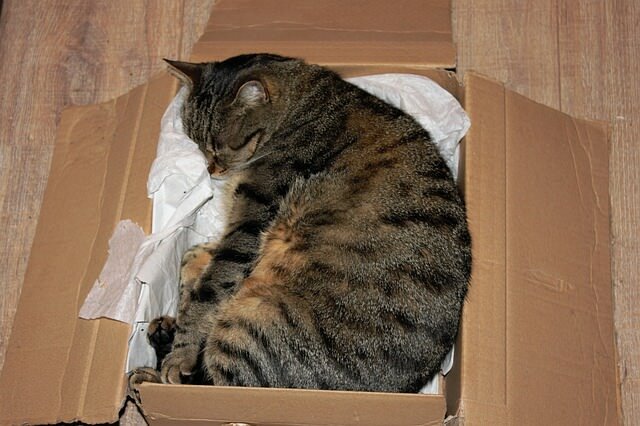 But our cats, who live in our homes, can have their entire environment radically changed in an instant. For the humans involved, the change is not a surprise and it is up to us to make the change as seamless as possible for our little fur friends. Make the journey there as easy as possible. 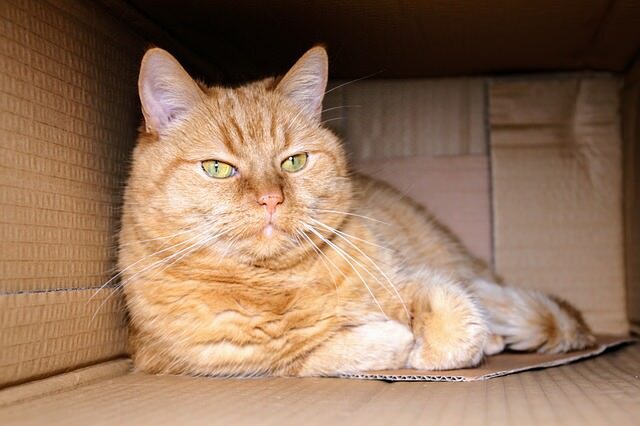 Help your cat acclimate to his carrier far in advance of moving day. It can be a portable safe haven and he should really love it. Pull it out into plain sight and fill it with soft, warm bedding and hidden treats. Once he is choosing to go inside, start closing the door and then slip scrumptious treats though the door or top. Make sure only good things happen in the carrier for several days before the travel. You might even have mealtimes inside the carrier only. If your cat already fears the carrier, ask your vet for something for anxiety to make him less fearful as he learns. Once he feels safe inside of it, walk around carrying it briefly. Some cats are immediately ok with their carriers and some take time. Short trips in the car with the cat in the carrier (in which you return home with nothing happening) can help too. When your cat is traveling in the carrier, it is best to cover it with a towel so he cannot see the road whizzing by and noises are buffered. Spray calming pheromones around your new home at least 30 minutes prior to the arrival of the cat. You can’t smell them, but your cat can and they will trigger a sense of calm for her. Keep food and water dishes the same for a while. 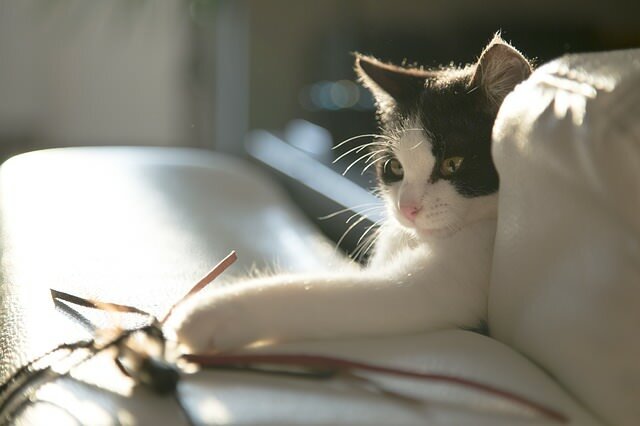 Even though you have a new home and you might want to have all new things inside, now is not a good time to replace things that are familiar to your cat. Keep her bed and make sure that she has hiding spots filled with familiar items. Restrain her to a smaller area filled with objects she is accustomed to for a few days and let her adjust. Gradually open the area and let her explore as she wants. Never force her into a new area and make sure that she can always retreat to her safe haven if she is startled. Keep schedules (feeding and playtime) the same, if possible. There is no doubt that you are busy, but make time for your cat to play and cuddle with you. If he knows that you are happy and calm in your new home, he is more likely to be also. Keep his carrier accessible to him. Remember, now it is his portable safe haven and if he feels startled, he can hide there. After several days, he should be readily exploring your new home and appear calm and relaxed. Once his body language exudes peace, you can gradually start making changes to his dishes and beds, if desired, but be sure to leave his favorites (or replace them with new exact replicas). Moving can be exciting and fun, but if your best friend is not adjusting well, it puts a damper on everything. A little planning can make things better for you both. Do you love cats? Learn more about them by finding me on Facebook.